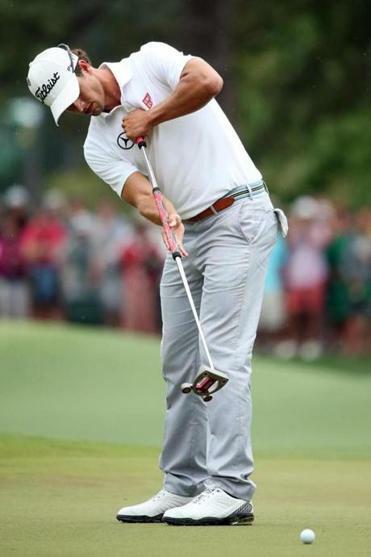 Adam Scott of Australia anchored his putt during the the 2013 Masters Tournament. Barring something dramatic, such as a legal challenge or a change of heart from golf’s governing bodies, anybody who plays the sport starting in 2016, from beginners to PGA Tour professionals, won’t be permitted to use an anchored stroke. That was guaranteed on Monday, when the PGA Tour’s policy board voted to accept the anchor ban approved in May by the US Golf Association and the Royal and Ancient Golf Club. The PGA of America followed suit Monday, announcing that it also will abide by the new rule, which is scheduled to take effect Jan. 1, 2016. Both the PGA Tour and PGA of America had been among the most vocal critics when the anchor proposal was announced last November, hoping that their opposition would potentially sway the ultimate decision by the USGA and R&A. When that failed and the proposal was approved, it was up to the tour and the PGA of America to either accept or reject the measure. They chose to accept, although both did offer a suggestion to the USGA and R&A: That the implementation of the new rule be delayed for amateurs until a much later date, instead of 2016. Use of an anchored putting stroke has become popular — and successful — on the PGA Tour in recent years, with four of the past seven major championships being won by players with either long putters or belly putters. It’s become a divisive issue, with some golfers (including Tiger Woods, Jack Nicklaus, and Arnold Palmer) speaking out against the anchored stroke, saying no swing in golf should be made while the club is anchored to the body. Those who anchor have maintained that it provides no statistical advantage over the standard-sized putter, pointing out that the vast majority of players don’t anchor. Nine players — Tim Clark, Carl Pettersson, and new Masters champion Adam Scott, plus six who haven’t publicly come forward — have retained Boston attorney Harry Manion, with Cooley Manion Jones. The players wanted to wait for the policy board’s decision before making their next move, which could include litigation. “The decision was not unexpected. My nine clients expected it, we all felt it was going to go this way,” Manion said Monday by phone from Chicago. “We’re pleased that the tour decided not to accelerate the rule’s applicability. The tour’s policy board met Monday in West Virginia in advance of this week’s Greenbrier Classic. The PGA of America reached agreement on accepting the ban last week.